Hailey Baldwin is often the first to jump on a new trend, and she's not afraid of pushing the limit with her own street style. 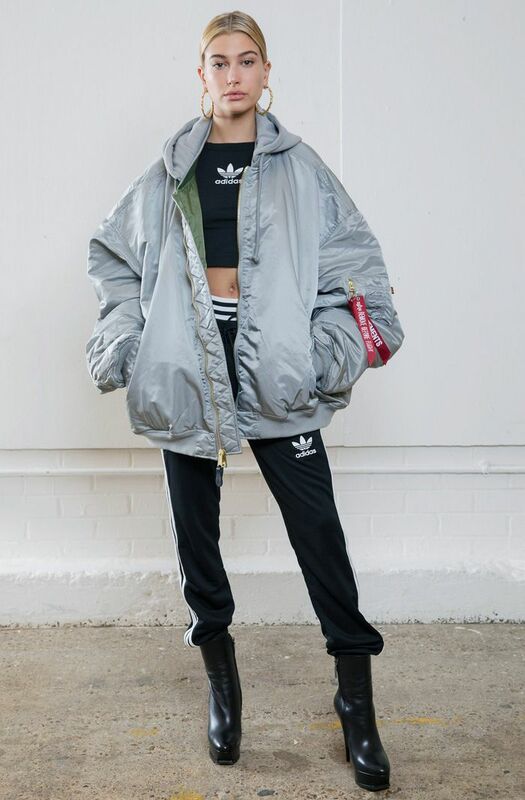 On the first day of London Fashion Week, she curated her own street style–inspired show for Adidas and JD Sports, and we caught up with the model backstage to find out her trainer rules and the trends we can expect to see her wearing for the next six months. Given this was a show centred around trainers, we had to ask her about her own sneakers collection. "It's incomparable how many pairs I have in my house right now," she said. "Yep, I have a whole room just for my Adidas stuff, and it's like a fitting room, and the majority of it is my Adidas workout wear and sneakers." Adidas; PICTURED: Hailey Baldwin at the Adidas EQT x JD Sports show. Hailey's friends Kendall Jenner and Bella and Gigi Hadid all share a love of trainers, but she reckons her collection is the biggest of them all. "I honestly think that I potentially own the most sneakers out of my friends—it's debatable though, I think between all of us … there's a LOT. Literally, we could have a [sneakers museum]." Hailey is such a sneakerhead that the number of pairs she thinks you should own is quite surprising. "You need your workout ones, your street ones…" she says. "I ruin sneakers a lot because I'll wear them out to like a party and they will get super destroyed. So you need multiple pairs of those because if you ruin one and you need to get rid of them. So like, 30? 40?! I don't know, that is excessive." The three styles she swears by are: "Stans I wear all the time, and the EQTs I wear a lot and the Ultra Boosts." We also had to ask Hailey about her favourite styling moves right now, and when it comes to trainers she says: "I wear sneakers with everything—I love to do a minidress with a pair of Stan Smiths, that's my go-to all the time. I love to wear sneakers with jeans and with sweats because I'm a big sweats person. I go back and forth, I love being in heels and sneakers." As for the trends, we can expect to see Hailey experimenting with over the next six months, she said it's all about sleeves for her right now. "I think the upcoming season of Saint Laurent is so fired—I love what Anthony Vaccarello is doing with them. My stylist knows how I like to wear things, and a big, long sleeve is exactly what I'm into. Really statement sleeves, and he's doing a lot of that in the Saint Laurent collection." "I also really like things to be really, really matchy," she continues. "With this Adidas collection, I like all the colours to co-ordinate really, really specifically—so I do a lot of matchy-matchy with my looks. Tan on tan or green on green." If we were friends with Gigi Hadid or Kendall Jenner, we'd find it difficult to stay away from their wardrobes, so how much clothes swapping really goes on within the group? "It's not like we're like Sisterhood of the Traveling Pants," Hailey laughs. "But if we're with each other, it's very normal—we'll borrow hoodies and pieces when at each other's houses." Next up, take a look back at Hailey Baldwin's best looks.